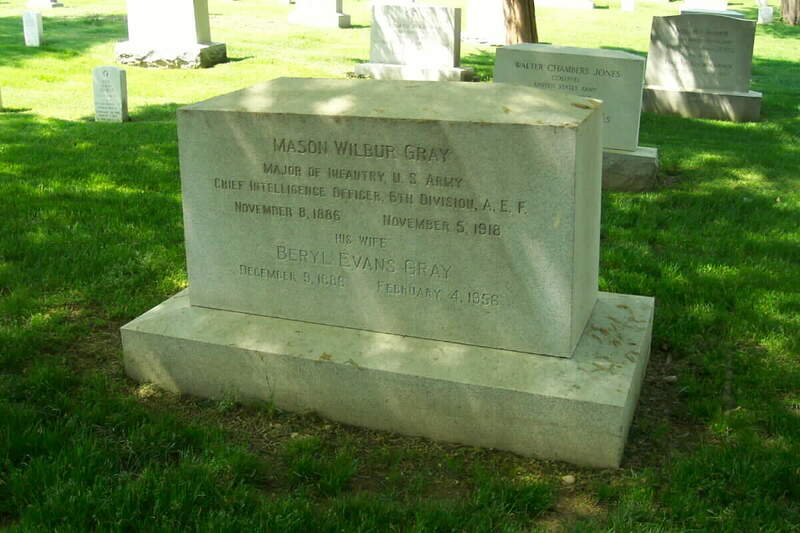 Mason Wilbur Gray was born on 8 November 1886. During World War I, he served as Major, Infantry, Chief Intelligence Officer, 6th Division, American Expeditionary Forces. While serving in that capacity, he was killed in action in France on 5 November 1918. He was subsequently returned to the United States where he was buried with full military honors in Arlington National Cemetery. His wife, Beryl Evans Gray (9 December 1886-4 February 1956), who outlived him by 37 years and who never remarried, is buried with him. We are actively seeking information regarding both the Major and his wife. Major Mason W. Gray, assigned to the Intelligence Office of the 6th Division, died in France November 7, 1918 of wounds received in action according to notice received by his wife, Mrs. Beryl Gray, at Dobbs Ferry, New York, from the War Department. Mrs. Gray believes some mistake has been made, for she thinks the office her husband held would not expose him to any great risks. Major Gray was born in Michigan thirty-one years ago and was graduated at Michigan University. Seven years ago he took the regular examination and was commissioned a Second Lieutenant in the Regular Army. He was stationed in Panama for three years and later saw service on the Mexican Border. For some time prior to sailing for France, May 1 last, he was at the training camps at Syracuse and Charlotte. He entered the Army Staff College abroad, was graduated with honors, and was made a member of the Federal Army Staff. A brother, Major Elmore B. Gray, is in France.